The Tepaneca tribe of Aztec/Nahua migrants arrived in Valley of Mexico in the thirteenth century, and took over cities such as Azcapotzalco from the native inhabitants. Becoming one of the most powerful cities under Tezozomoctli to the point that it dominated Tenochtitlan, the eventual seat of the Aztec emperors, the city set about creating new colonies or taking over existing cities throughout the region. Atlacuihuayan was probably founded by Tezozomoctli of Azcapotzalco when he installed one of his sons - Epcoatl - as its ruler (another son was installed as the ruler of Tlatelolco). This 'founding' doesn't rule out the existence of a settlement before this, though. Cities could often be founded by new rulers who rebuilt the efforts of the rulers or people they were replacing or now dominating. Koch seems to suggest that it was an abandoned town when the Mexica were battling against Culhuacan for land, possibly a generation or two before Epcoatl's time. 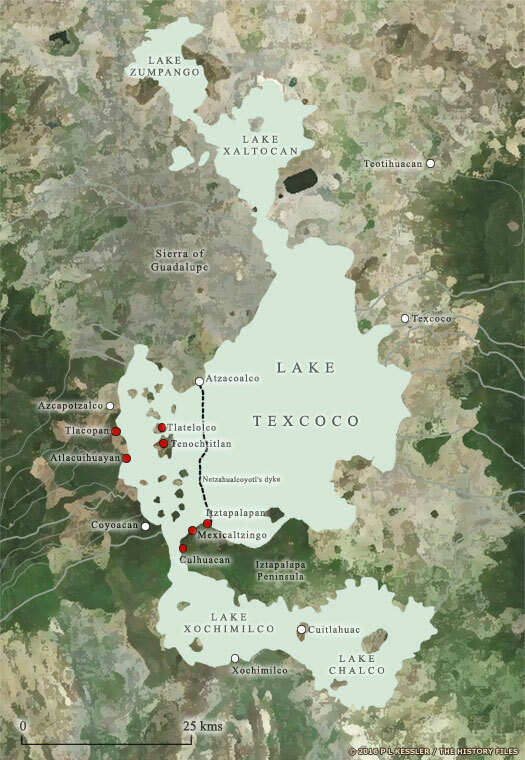 The name seems to mean 'place where the water is taken', which would be appropriate for this city's location on the western shore of Lake Texcoco, around ten kilometres to the south of its parent city. Today it forms part of the Tacubaya region of Mexico City. Following the long reign and death of Tezozomoctli of Azcapotzalco, he is succeeded as ruler of the city by a son, Tayatzin. However, Maxtla of Tepanec, the older half-brother of Tayatzin, soon incites a rebellion among Azcapotzalco's nobles and usurps the throne. Chimalpopoca of Tenochtitlan allies himself with Tayatzin, and the two conspire to retake the throne and kill Maxtla. In the end, Tayatzin is killed and Maxtla secures his hold over Azcapotzalco. This means that he is also Atlacuihuayan's new overlord, although Tlatelolco seems to escape this fate. The Azcapotzalco title, Tepaneca tecuhtli, 'Lord of the Tepanecs', is inherited by Totoquilhuaztli of Tlacopan. With the defeat of Maxtla the following year by the Triple Alliance under the new ruler of Tenochtitlan, Itzcoatl, Azcapotzalco is incorporated into the Aztec empire. The fate of Atlacuihuayan is not known but it has to be assumed that it too is incorporated into the empire. Epcoatl's fate is equally unknown. His survival probably depends upon how quickly he submits to Maxtla or Itzcoatl. The Spanish conquistador Hernan Cortes and his second-in-command, Pedro de Alvarado, arrive at Tenochtitlan from Cuba. Emperor Moctezuma welcomes Cortes, thinking he is the legendary god-king, Quetzalcoatl, returned to claim his kingdom as he had prophesied. Some of his men claim that the city of Moctezuma (Montezuma) is one of the largest in the world, comparable to Paris and Venice. Alvarado orders the 'Massacre of the Great Temple', finally spurring the Aztecs into resisting them. 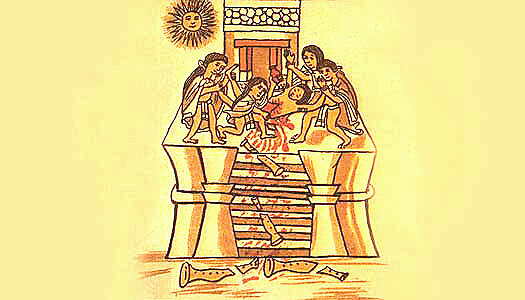 Moctezuma is killed during the breakout from the city by Cortes and his men. Following a siege which destroys much of the city, Tenochtitlan is defeated by Spain on 13 August. Along with its tributary states which include Atlacuihuayan, it is drawn into what is becoming New Spain. This defeat marks the end of Aztec civilisation. Cortes orders the rebuilding of the city, with the natives banished to its outer areas. Much of the Aztec city is eventually built over and lost under Mexico City (so named because it had also been the capital of the Mexica, the name by which the Aztecs had been contemporarily known. Some of it has since been rediscovered and saved for posterity).